Most guitar methods merely give you content..they show you WHAT guitar players do. They do not teach you how to train yourself to do it too! That is where GuitarPrinciples is different. Before GuitarPrinciples, there was no step by step method for students to follow that absolutely guaranteed success by showing not just the notes they needed to play, but how to train their fingers to play those notes! Before GuitarPrinciples, some people managed to "get it", and many people didn't, and gave up in frustration. After GuitarPrinciples, there is no good reason for any student to fail to learn to play well, and no good reason for any teacher to fail to turn every willing student into a real guitar player. After GuitarPrinicples, no student should ever accept this musical kiss of death from their teacher that goes like this "Sorry, but you have no natural talent". After GuitarPrinciples, it has been proven that anyone can learn the guitar well, whether they have "natural talent" or not. 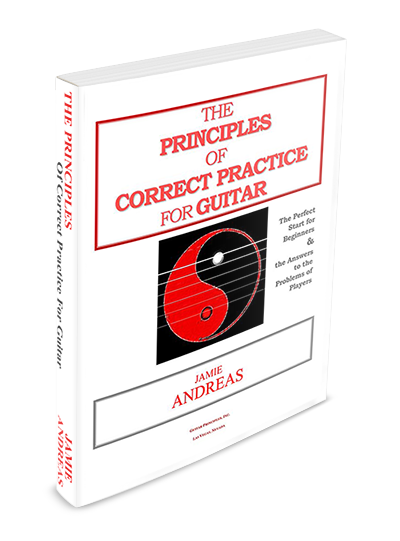 The story of Guitar Principles began in September of 1998 when the first ”Principles” book was published, or should we say, printed. More like a booklet than a book, it was 62 pages long, and was bound by a white plastic coil which caused the book to contort into various bended shapes with heavy use by Jamie’s more serious students. “The Principles” had no photos in it, but instead had several “technical” illustrations. The manuscript was brought to the local Minuteman Press by the good old-fashioned method of camera ready artwork… paste up and mechanicals. The first printing was a volume of 50, and some of Jamie’s students, friends and supportive relatives bought them for $15 each. The day it was picked up at the printer’s there were celebrations by everyone who knew Jamie….mainly because it allowed for all the 8 1/2 X 11 paper signs to finally come down from the walls that were scotch taped all over her house like wallpaper. The taping process had typically started with the refrigerator but within days, expanded beyond. No room escaped from being part of the guitar instruction book project, not even the bathroom! Each sheet had a concept written on it, sometimes just a few words, sometimes an entire sentence was scribbled out in magic marker, pen, pencil, whatever was handy at the time the thought occurred which needed to be included in the book. Jamie’s place looked like a hobo home for over three years, and when the “Principles” papers were taken down to reveal the most putred gray fake wood paneling, the walls actually looked even worse than when it had the “Principles” wallpaper covering them. Many friends and family members felt they had made a mistake teasing Jamie all those years. They had made for great conversation, and people missed them. In any case, the wallpaper became the book, and the paneling was eventually painted white. Prior to the first printing of the “Principles’ book, Jamie had been teaching guitar for over 25 years to every type of student, from children to teenagers and young adults to senior citizens well into their 80's, as well as every style of guitar… folk, jazz, rock, blues, and the classical guitar. Over her years of teaching, the answers to these problems began to emerge. She became obsessed with developing a guitar practice method that would supply all the essential knowledge of how to practice from the very beginning of picking up the guitar, and one that would be used forever after, no matter what the level of the player. She developed a system of progressive exercises to train the hands and fingers for flawless functioning on the guitar, and one that guarantees success in learning to play. "The Principles of Correct Practice for Guitar" was born. The very first purchasers of “The Principles”, Little Victor and Big Phil at the home in which the Principles was authored. Follow the arrow to see what they brought to every lesson. With the advent of the internet, Jamie became a consultant for the AOL guitar group and wrote many “Principled Essays” called "Weekly Wisdoms". The feedback from readers was incredible! Students from around the globe began using her method and getting great results from their practice. There wasn’t a day that went by where the emails did not pour into Jamie’s inbox reporting great progress. One student simply wrote in… “It works! Thanks, Jamie!” Her private students, too, were moving along fast and overcoming their long-time playing obstacles. Her “Principles” system was in full gear. "To enable anyone who wants to learn the guitar to be able to do so, regardless of age or background. Also, to enable anyone who plays the guitar to advance to their next level as a player. This is done by teaching the student how to practice to get results by using "The Principles of Correct Practice for Guitar". Less than a week later, the first $15 check arrived in her Post Office box in response to her website advertisement. The Guitar Principles word spread on the net as being the most effective and results-oriented method available to learn guitar and the books started flying off the shelves. Jamie needed help with what was becoming her small, independent publishing company. She first hired Steve, one of her rock guitar students while he was still in college, and soon after she hired her best friend, Geraldine, who had a handful of small businesses to her credit, as well as an artistic background. Geraldine is with Guitar Principles today. With Jamie as prolific as she is, and with her continued passion and energy to teach guitar and see results from her students, the Guitar Principles website grew day by day to over a thousand pages in a few short years, with over a million visitors a month. Since then, a wide range of resources including books, DVD’s, and the most recent addition of online courses and downloads have been created, each one filling a vital need in the existing guitar instructional literature. The last page of the original "Principles", which tells people to constantly re-read the book - since then, thousands of people the world over report that they do! Guitar Principles continues to grow in both size and stature with its sole purpose remaining intact, as expressed in its original Mission Statement. Although it has changed in many ways since, all Guitar Principles is really interested in is helping guitarists reach their full potential. Thousands of players worldwide travel the journey toward their own excellence and are discovering for themselves the undeniable power of "The Principles" to propel them constantly forward to their goals. Unlike most stories, this one has no end. It continues day by day, practice session after practice session, insight after insight, as Jamie continues to produce the most comprehensive guitar instructional material the world has ever seen, or likely ever will.